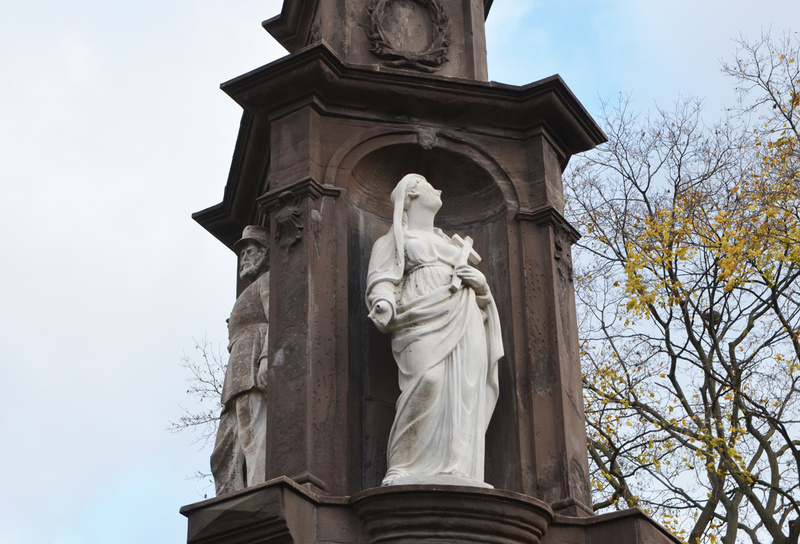 This monument, by Robert Reid, was unveiled on 1st July 1870. It is located on the University of Toronto side of Queens Park Circle. The Battle of Limeridge (also known as the Battle of Ridgeway) was the first fight during what is known as the Fenian Raids. It was fought near the village of Ridgeway which is across the Niagara River from Buffalo NY, close to Fort Erie. 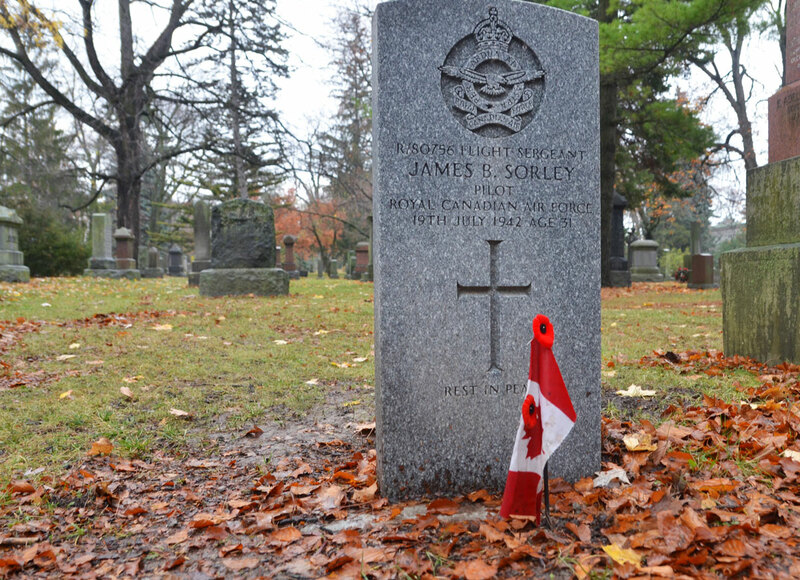 It was the first time that a battle was fought by Canadian troops and led by a Canadian. They lost the battle. There were a few more skirmishes but the Fenians fled back across the Niagara River when British troops and Canadian reinforcements arrived a short time later. 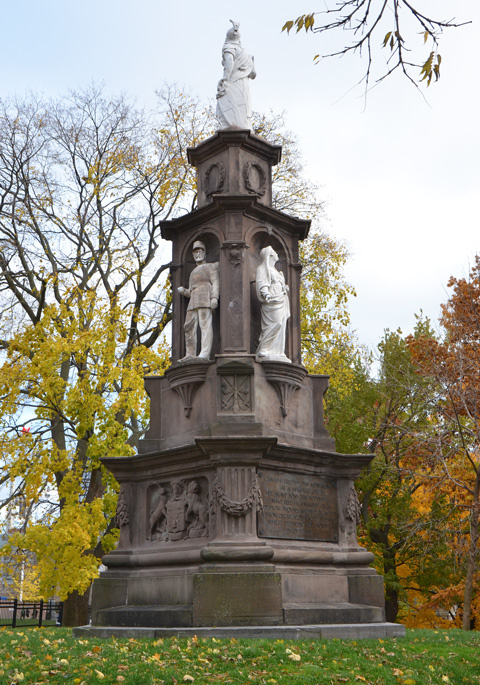 The funds for the monument came from donations from the citizens of Toronto. 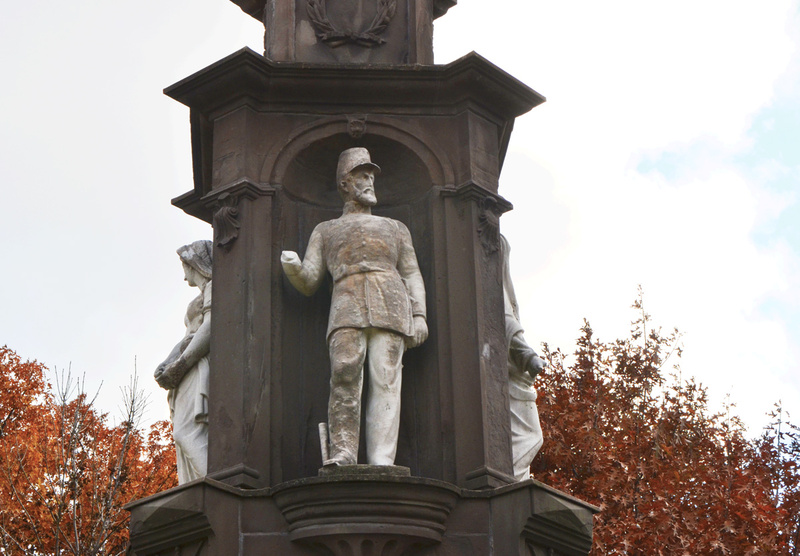 The Canadian government refused to recognize the Limeridge veterans until 1899. The loss had been blamed on the frontline troops that panicked and broke even though they were out numbered, undersupplied and undertrained. 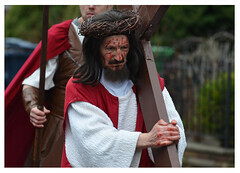 The officers in charge had been absolved. The Fenians were Irish-Americans, many of them veterans of the US Civil War which had just ended. Their goal was to take Canada hostage to provoke a crisis in England that would lead to an independent Irish Republic. At the time, Canada was still a British colony. On June 2nd 1890, the Veterans of ’66 Association held a protest by this monument and they placed flowers around it. The protest became an annual event. 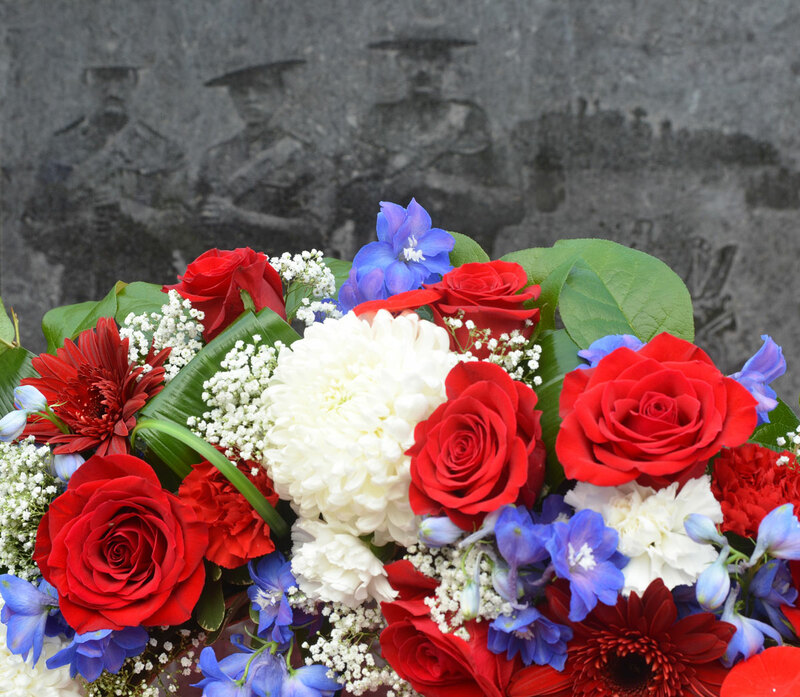 June 2nd became known as “Decoration Day” as memorial to Canadians who died in the Battle of Limeridge as well as the Northwest Rebellion (1885), the South African War (Boer War) (1899-1902) as well as the Great War (WW1). 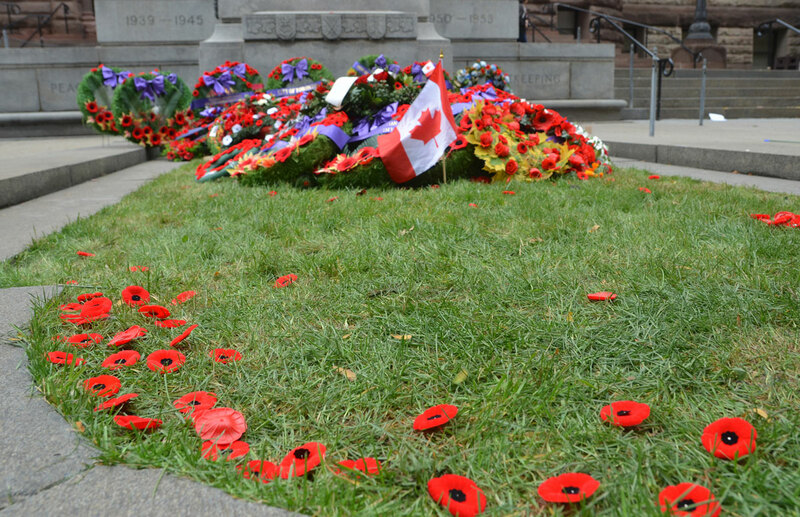 It wasn’t until 1931 that November 11th became Remembrance Day. The passing of the Remembrance Day Act in 1931 removed the losses from the Fenian Raids and the Northwest Rebellion. It is specifically for Canadian casualties overseas. 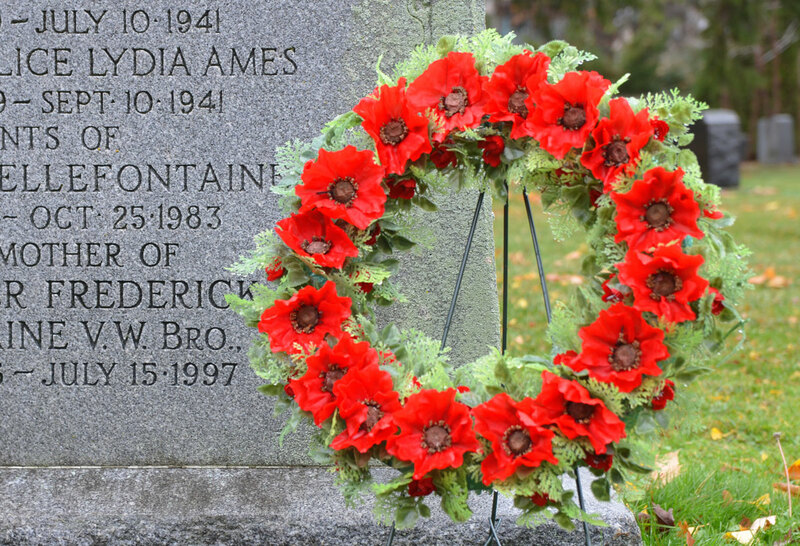 The poppy became a symbol of Remembrance day, and a symbol in remembrance of soldiers who died fighting in all wars, after the publication of the poem ‘In Flanders Fields’ in 1915. 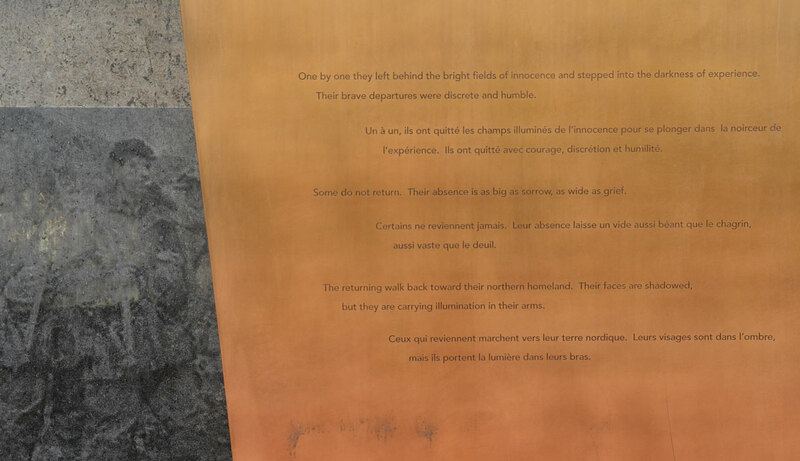 This popular and often quoted poem was written by Canadian Lieutenant Colonel John McCrae. In it he talks about the poppies that grew in the battlefields at Flanders Belgium during WW1. 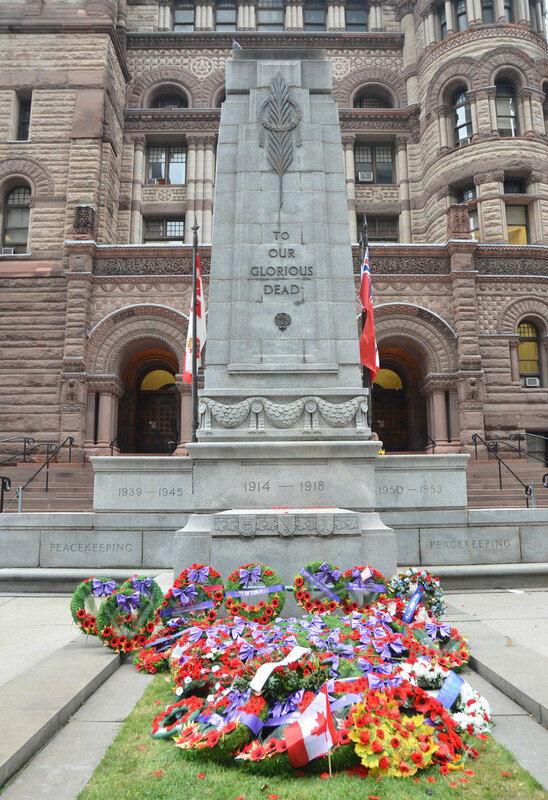 below: The cenotaph (war memorial) in front of Old City Hall was unveiled on 11 Nov 1925 to commemorate those Torontonians who died in WW1. Since then, it has been expanded to include those who lost their lives in WW2 and in the Korean War. The word cenotaph comes from the Greek and translates as ’empty tomb’. This style of memorial has been used widely for commemorating someone, or some group, whose remains are interred elsewhere. 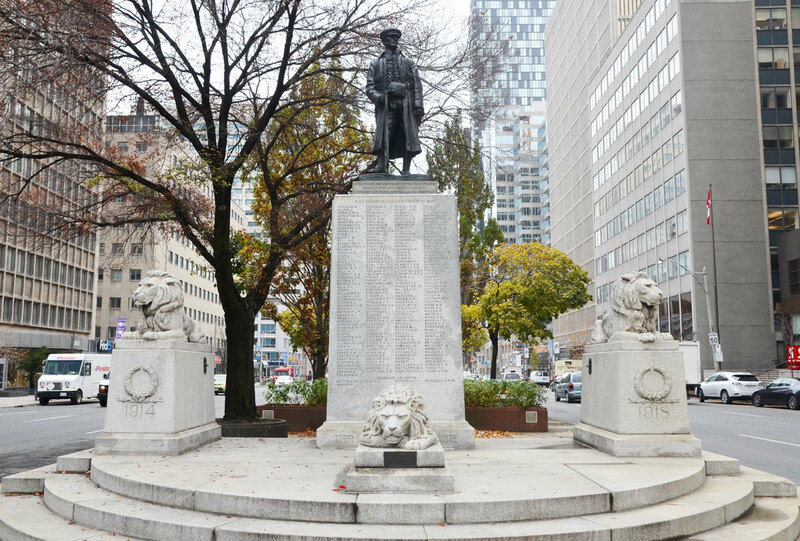 In the middle of University Avenue is a statue erected by the Toronto District of the Sons of England Benefit Society in memory of their members who died in World War 1. 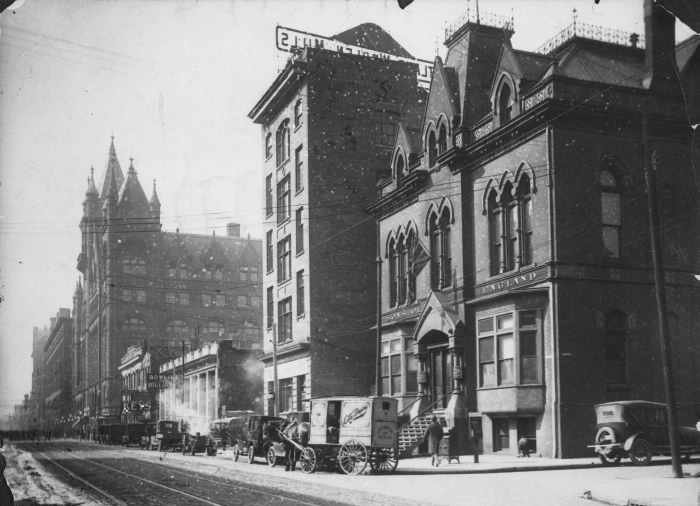 Founded in 1876, this society provided insurance to its members who were in need because of illness or accident. In 1914 Canada was still part of the British Empire. As a result, when Britain found itself at war in August of that year, Canada too was involved. 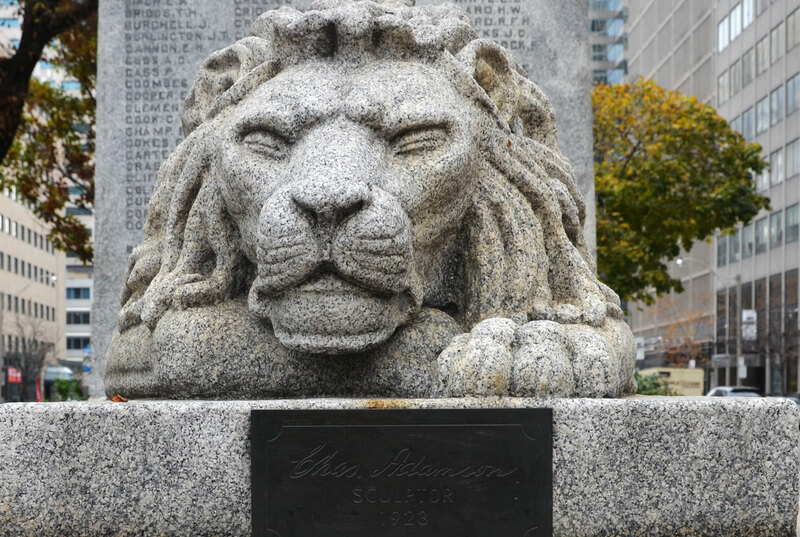 below: At the base of the center lion is a small plaque that reads: “Chas Adamson, sculptor, 1923”. Another memorial in this city is the Ontario Veterans Memorial. This is a 30m long granite wall in front of Queens Park dedicated to all the men and women from Ontario who served in the military. 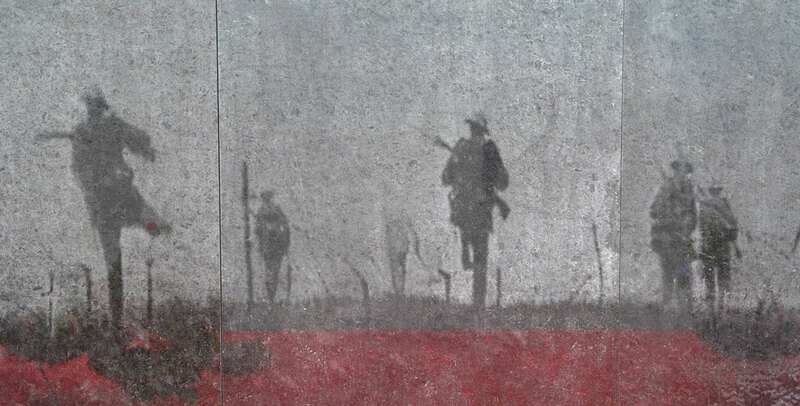 Etched into the granite are scenes depicting Canadians in military roles between the time of the Fenian Raids in 1867 to the present day. below: Part of the granite wall. 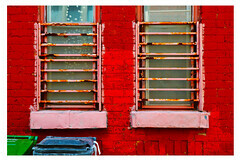 The red in the picture is a reflection of the red carpet that was laid in front of the memorial for the Remembrance Day service. Their brave departure was discrete* and humble. Some do not return. Their absence is as big as sorrow, as wide as grief. aussi vaste que le deuil. but they are carrying illumination in their arms. mais ils portent la lumière dans leurs bras. 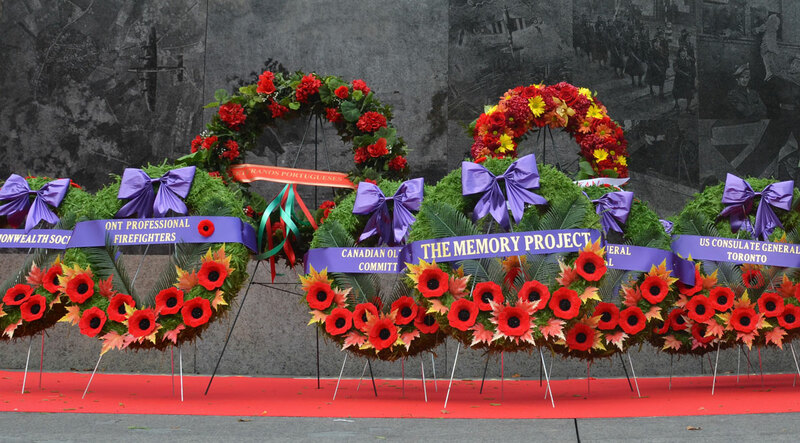 below: Some of the wreaths laid at the Ontario Veterans Memorial on Remembrance Day. below: Although it is not a war memorial per se, someone left a small poppy wreath by this plaque at Nathan Phillips Square. The plaque is by the arches over the pool, the freedom arches. Transcription of the plaque: Freedom Arches. 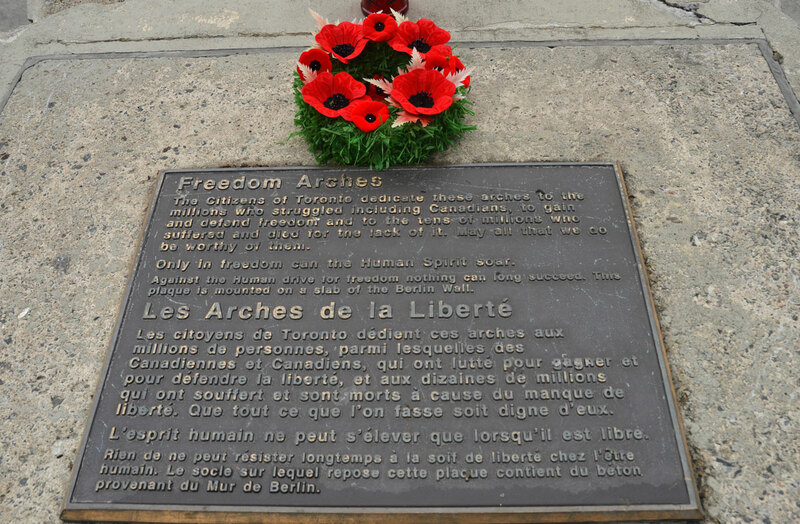 The citizens of Toronto dedicate these arches to the millions who struggled, including Canadians, to gain and defend freedom and to the tens of millions who suffered and died for the lack of it. May all that we do be worthy of them. Only in freedom can the Human Spirit soar. Against the Human drive for freedom nothing can long succeed. This plaque is mounted on a slab of the Berlin Wall. 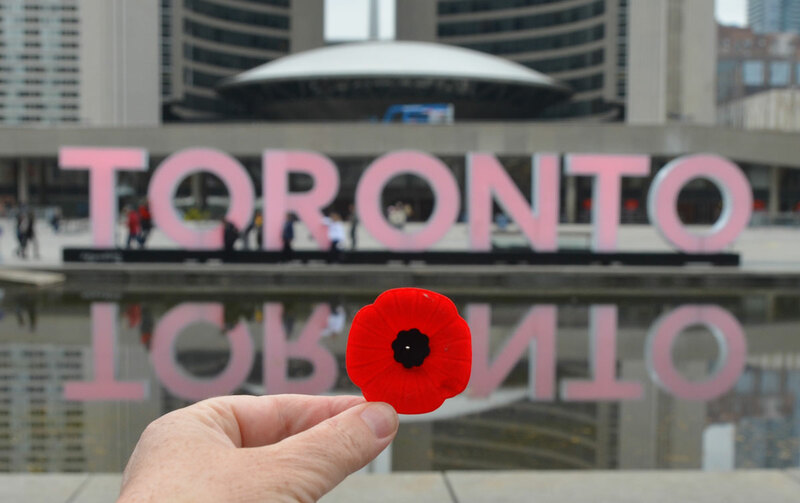 below: The 3D Toronto sign was red on Remembrance Day. We remember collectively as a nation, as a community. We also remember privately, as individuals, as families. Countless small memorials can be found around Toronto including in schools, in churches and other religious institutions, and in cemeteries. 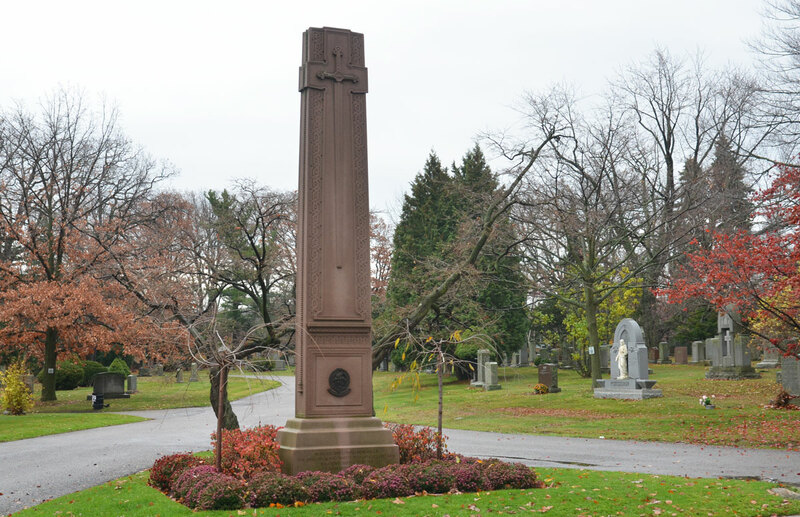 below: A memorial to the 48th Highlanders, Mount Pleasant cemetery. 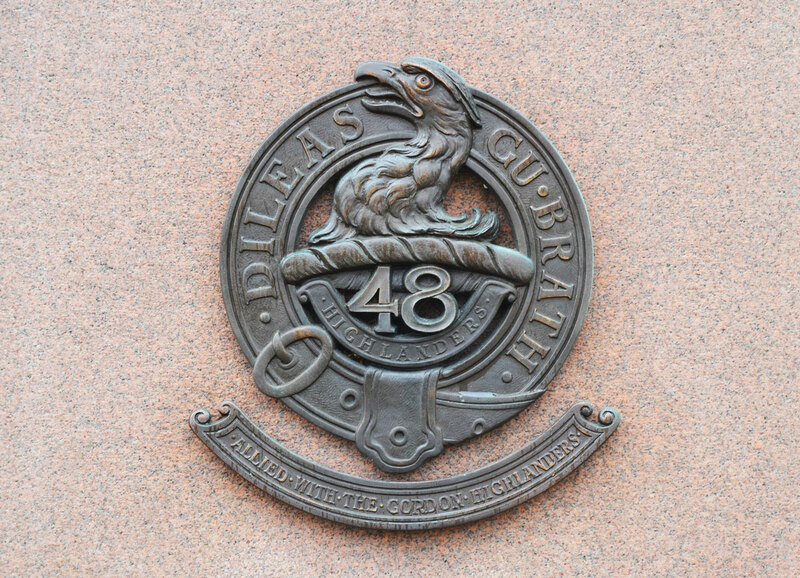 In memory of the officers, non-commissioned officers, and men who have served with the 48th Highlanders.